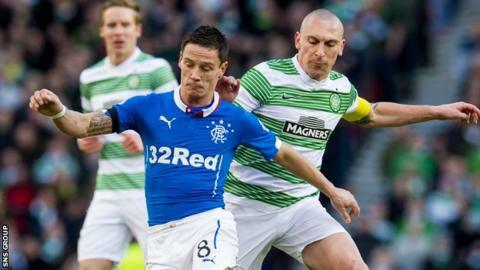 Scotland's football authorities should drop gambling firms as sponsors or change the regulations on players' betting, according to Ian Black. The former Rangers midfielder, punished for a gambling offence in 2013, told BBC Scotland that reform is needed. "They've got a cheek taking money from betting sites as sponsors and then doing players for betting," Black said. The Scottish Professional Football League says investment by bookmakers has "benefited all 42 clubs". All of Scotland's senior leagues and cup competitions are backed by bookmakers' firms, while footballers playing in Scotland are prohibited from betting on any matches. Black, 32, was fined £7,500 and given a 10-match ban, with seven of those suspended, after admitting to placing bets on 160 matches over a seven-year period. The charge included betting against his own team on three occasions. "It was a sore one. I shouldn't have done it and it's gone now, but I was made an example of, that's for sure," said Black. "I got hit hard. "Looking at it now, you've got directors [Aberdeen's Duncan Skinner] getting a £500 fine." A Scottish Cup winner with Hearts in 2012, Black insists gambling remains a widespread pursuit for footballers. "It was probably rife before I started kicking a ball and it will keep happening," he said. "It goes on everywhere and it's still going on. It's a worldwide problem and you won't stop it." The SPFL is close to agreeing an extended and improved sponsorship deal with Ladbrokes. And a league spokesman said: "Significant investment by bookmakers in recent years has benefited all 42 clubs and supported the growth of Scottish football. "There is a clear and sensible distinction between the rules applied to those who can influence the outcome of a game and fans betting responsibly." Black, who insists he has "never had a gambling problem" added: "Scottish football people will say it's because the game will die a death because no-one else will sponsor them. "Drop them or look at the rules, but it's never going to stop, for the rest of my life anyway. "They are scrutinising players but sitting there with the billboards everywhere. Scrap them as sponsors; go and find somebody else." Black, who has signed for Tranent Juniors after a spell with English Conference North club Chorley, believes the blanket ban on players betting is flawed. "If it's a game you're playing in, that's understandable," he said. "But to bet on another team beating another team; I don't understand how we can influence that." A spokesman for the Scottish FA responded: "The SFA takes its responsibility towards gambling within football seriously and has clear rules in place prohibiting gambling, which apply to players, referees and directors. "In addition, we have delivered comprehensive gambling education workshops to all 42 SPFL clubs and academies. "Scottish football has long enjoyed productive relationships with a number of betting companies and we are grateful for their continued support of our national game."